Welcome to My Laboratory: Yogurt From Scratch – I'll Make It Myself! 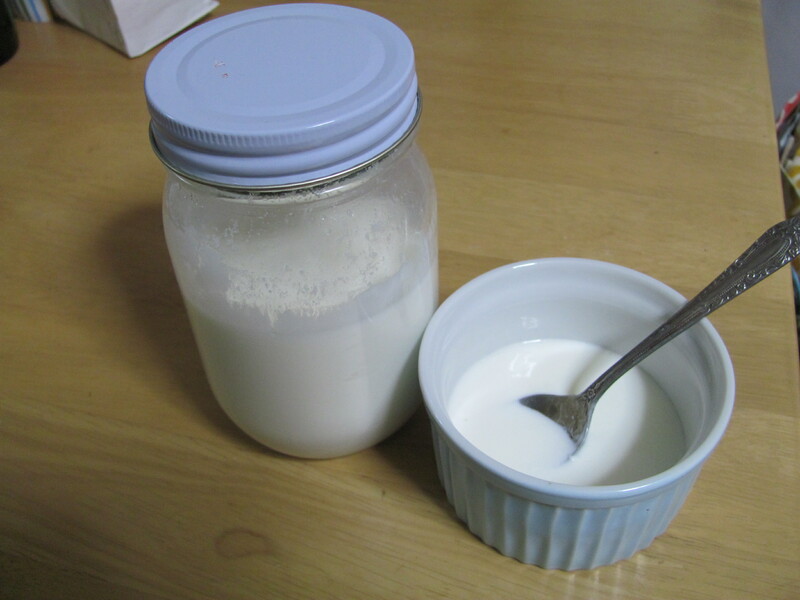 発酵乳 (hakkounyuu): fermented milk, yogurt. Yogurtis commonly called ヨーグルト (youguruto) in Japanese, after the Turkish term also used in English. I have a Master’s Degree–in Science Japan Studies! My 2011 New Year’s resolution is to reduce my plastic waste, and the best way I know how to do this is to be a better shopper. This week, I went to the co-op across the street from the nice grocery in town and found locally produced milk in glass bottles that you bring back to the store so the farm can reuse them. Excellent! I don’t drink milk fast enough to justify buying a lot of it, so I usually get soy milk, which lasts longer—but has unrecyclable packaging. * With this milk, I decided I would need to make something with it to help use it up—scones or kabocha soup. Then I remembered this idea that had been floating in the back of my mind: yogurt. Denaturing proteins! Healthy bacteria! What could be more exciting than being able to eat your science experiment? The thing about making yogurt is that you have to keep it warm while the bacteria is incubating, and American cookbooks usually recommend doing this with a oven; some recommend using an insulated cooler with jars of hot water in there. 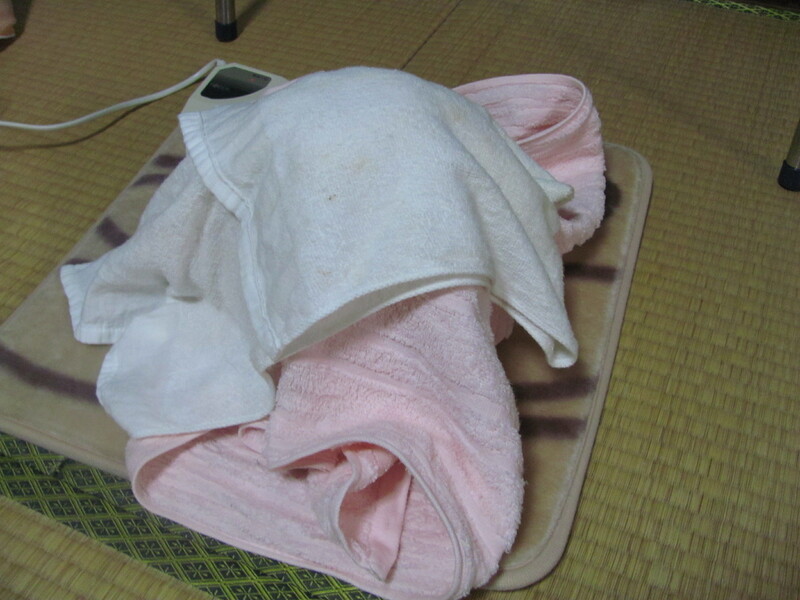 ** I have neither, but the Ishikawa JET Blog, where I first learned about making yogurt, had a solution for Japan: use a heating pad. The post didn’t have enough details to answer my questions about sterilizing the jars, but luckily, my very first purchase on amazon.co.jp was Joy of Cooking, and there’s a section in the back about making yogurt and sterilizing jars. The following recipe is sort of a hybrid of a variety of recipes, but is mostly based on the one in Joy of Cooking, as that one has the best information on temperatures, but the incubation method is IJET’s. At first, I boiled my jars (not the lids), but I’ve since decided to go with the method from other blogs of just pouring boiling water into their jars and letting them sit for ten minutes, then dumping the water and inverting the jars and lids on a clean towel. Finally, 500 mL of milk yields about 250-300 mL by volume of yogurt, so if you use half a liter/500 mL/2 US cups of milk, you get enough to nearly fill an 8 oz. jar. If the jar is too big, that’s fine, since the yogurt needs some “head room” to cultivate properly. For some crazy reason, I thought that 500 mL of milk would yield as much yogurt, but the milk reduces in the boiling process. My batch had a slightly thinner consistency than Meiji’s Sonomama yogurt, which I used as a starter. I topped one of my Nagano apples with a bit of this yogurt–total breakfast bliss brought to you by science! Use 2.3-2.5% milk. For whatever reason, my yogurt works best with this rather than skim or whole. ~2% milk is actually not that hard to find in Japan. 7-11’s store-brand cow’s milk (gyûnyû, 乳牛) is 2.3%, and I’ve found at least two other brands in Kanazawa. Just look on the side of the carton for the percentage of fat. Please note that Japanese milk tends to be labeled as “100% milk” on the front to indicate that it is not a yogurt drink or Calpis or milk coffee (or cut with water). Cool to 44 degrees C before adding the (approaching) room-temperature yogurt. This makes sure the batch doesn’t get below 42 degrees, which may make it runny. If you cool the milk too much before adding the yogurt, you can reheat it a bit first. Incubate overnight (8 hours). I try to time the milk-processing to finish at 11 pm (it takes about 30-60 minutes) so that I can leave the heating pad on overnight and then pop the yogurt into the fridge when I get up. Make a bigger batch: use 2-3 TBSP yogurt per every 250 mL milk. I often use 1-1.25 liters of milk and 12 TBSP of yogurt to yield about 800-900 mL yogurt. Choose a yogurt you really like as the base. I have better results with some of the “creamy” German-style brands here than with Meiji. 2. Sterilize the jar(s). Pour boiling water into clean glass jars and lids and let sit for 10 minutes. 3. Prepare the milk. While the jars are boiling, heat the milk on low-to-medium flame. The milk needs to reach 82 C (180 F), or almost boiling. Stir often and use your food thermometer to check the temperature. 4. Prepare the jar. Dump out boiling water after 10-15 minutes and set jars and lids mouth-down on a clean towel to remove some of the moisture. 5. Cool the milk. When the milk reaches 82 C (180 F), turn off the heat, and let the milk cool to 44-43 C (111-109 F). 6. Turn on your heating pad to low (or on, if it only has one setting) to let it warm up, and place a clean towel on top. 7. Add the starter. When the milk has cooled to about 44 C (111 F), add the room-temperature yogurt and stir to incorporate. Do not let the mixture go below 42 C (106 F). 8. Incubate. Pour the mixture into a sterilized jar(s), and leave some head-space. Seal the jar with a clean lid, wrap in the towel, and set on the heating pad undisturbed for 6-8 hours. 10. Optional: For a creamier consistency, put the yogurt into the freezer for 15-20 minutes, then move into the refrigerator. I usually don’t do this, but it helps with the skim yogurt. Or, run it through a coffee filter to get Greek-yogurt style consistency. 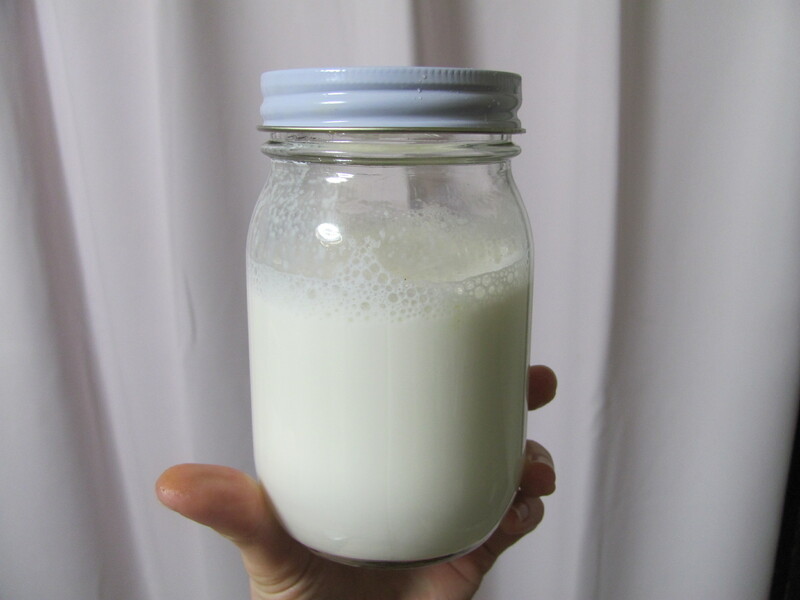 The yogurt will keep for about 6-7 days, so label your jars and remember to reserve 2-3 Tablespoons per 250 mL of milk (<5 days old) for the next batch. You can reuse the jars and lids. *Japanese milk cartons can be cleaned and flattened, then returned to the store for recycling, but the soy milk I get comes in a different style of carton can isn’t eligible for the town’s recycling. **In this case, the yogurt needs to kept at 37.8 C [100 F], but the plate in the oven range rotates, which would disturb the culture. ***Using more starter will not make the process faster. “The bacillus, if crowded, gives a sour, watery product. But if the culture has sufficient space or room to ‘work,’ it will be rich, mild, and creamy” (Rombauer, et al. : 1030). Dena. “D.I.Y. 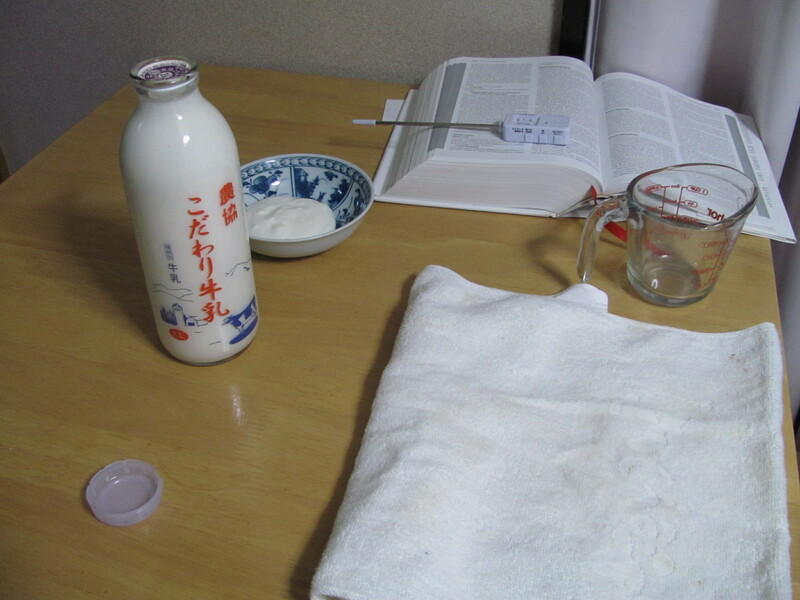 Yogurt.” The Ishikawa JET Blog. 2009 Feb. 1. Livelonger. “How to Make Your Own Yogurt – Step-By-Step Guide with Pictures.” HubPages. ——. “Putting Up Preserves.” Joy of Cooking. Scribner: New York, NY. 2006 . pp. 929-30. Pingback: The Quest for Kabocha Curry « I'll Make It Myself! Pingback: My Secret Weapon: Chocolat Brewery Cupcakes « I'll Make It Myself! Pingback: Recipes Revisited « I'll Make It Myself! Pingback: Spiced Persimmon Cake « I'll Make It Myself! Thanks for the info! I just made yogurt for the first time today – for my daughter’s science fair experiment – and it was so much fun! Hope I can discipline myself to make it regularly for our family. Pingback: Hot Weather, Cool Kitchen: Overnight Oats « I'll Make It Myself! Pingback: The Jam of Oppression? : Feminism, “New Domesticity,” and Gender-Neutral Home Cooking « I'll Make It Myself! Pingback: Oatmeal Sandwich Bread (Bread Revolution Series) « I'll Make It Myself!